An excited Justin Upton rolled into Turner Field with brother B.J. and the rest of his family on Tuesday as the Atlanta Braves introduced the newest addition to its potent young outfield. Upton was living amidst speculation that he could be traded by the Arizona Diamondbacks for months. Numerous teams inquired, and an early January deal to the Seattle Mariners was ultimately vetoed by the young outfielder. For the native of Chesapeake, Virginia, this trade to Atlanta represented the perfect opportunity to begin the next chapter of his career. Having the chance to play with his brother and be closer to his entire family is a dream scenario. One that the Upton brothers could not have foreseen would play out so favorably, or so soon. Their dream of playing together became a reality when the Braves and Diamondbacks agreed to a seven-player trade on January 24. 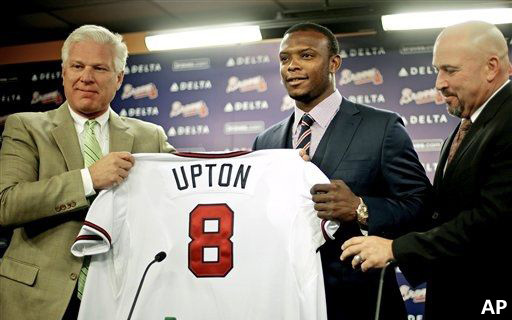 Upton and Chris Johnson came to Atlanta in exchange for Martin Prado, Randall Delgado and three prospects. Even before signing the elder brother, B.J., to a five-year free agent contract in late November, Braves general manager Frank Wren was intrigued to discover that Justin might be available. Initially, Diamondbacks GM Kevin Towers was shopping for a young, major league ready shortstop and Wren was not interested in trading away Andrelton Simmons. Once Arizona pulled off a three-team deal that landed Didi Gregorius in part from the Cincinnati Reds, Arizona’s desire for Simmons was no longer a stumbling block. “I think after that we started to settle in on some names and started building the deal as it turned out,” said Wren in regards to renewing negotiations following the nixed deal between Arizona and Seattle. Bringing the Upton brothers to Atlanta generates an exciting dynamic for the team as it moves on from the Chipper Jones era. Specifically, combining the Uptons with Jason Heyward creates one of the finest outfields in baseball, a fact that is not lost on Justin. With the Uptons and Heyward all young and under team control for a minimum of three seasons, Braves fans can expect many special things to come. The back and forth NLDS battle between Atlanta and San Fransisco came to a close on Monday, with the Giants taking a series clinching 3-2 victory. And with that, a Hall of Fame career came to a close. Thinking of life after Bobby Cox is something that most Braves fans have spent much of the 2010 season trying to come to terms with. We all knew it was coming, but this changing of the guard compels one to wax poetic. How do you put a career of that magnitude into perspective? Break out the book of cliches and turn to the chapter that deals with respecting others and receiving the same in return. Bobby Cox makes each and every one of them ring true. It’s safe to say that no other manager of this generation has garnered a fiercer loyalty from the men who played under him. Cox has been a constant with the organization for the better part of three decades. It’s hard to imagine there being a time in which the Braves organization won’t have his steady hand heavily involved with shaping the roster, as he did as general manager, or steering the product on the field. Most organizations will never know what it is like to have that kind of stability. Often second guessed and at times scrutinized, but universally respected for his knowledge of the game and commitment to his players, Cox has cemented his legacy among the greatest managers in the history of the game. Consider the tenures of most managers in the game today. Save a Tony LaRussa, or a Joe Torre, or a Jim Leyland, most have not served anywhere close to the number of years which Cox has. Even in a long and distinguished career, how many managers are staying with one club for two decades at a time? Beginning in 1978, when he took the helm of an entirely different Braves team, Cox made an immediate impact. Sure, the Braves teams under Cox of the late 70s and early 80s didn’t show immediate results, but his brush strokes were everywhere when the team captured its 1982 West Division crown under Torre. Take a lanky catcher with throwing problems and turn him into a gold glove center fielder? Cox has done that. Just ask two-time NL MVP Dale Murphy, who has openly stated that the decision to change defensive positions made by Cox was the saving grace of his career. The legacy of Bobby Cox will rest as much on the loyalty that was built in the clubhouse as it will on the wins that happened on the field. Cox created a winning environment in which every one of the 25 men on his roster knew that Bobby believed in their ability to thrive in pressure situations. So as this afternoon’s press conference signals the end of one era, a new one will begin. What that will be is anyone’s guess, but Cox will be a tough act to follow. Atlanta was one strike away from victory before the San Fransisco Giants stunned the Braves with a ninth inning rally in Game 3 of the National League Division Series on Sunday. The defensive woes of second baseman Brooks Conrad fueled the Giants comeback. Conrad committed three errors on the night, including a costly miscue on a ground ball that allowed the eventual winning run to score in the top of the ninth as the Giants took a 3-2 victory. Momentum has been swinging back and forth between the two clubs, in both single contests and the series itself. Great pitching performances by both Tim Hudson and Jonathan Sanchez had the two teams locked squarely in another one-run battle into the late frames. Hudson went seven innings and allowed just one unearned run on four hits and four walks while striking out five. The lone run against him came across during the second inning, when Conrad dropped a flyball in shallow right field to allow Mike Fontenot to cross the plate and break the scoreless tie. Sanchez continued the Giants starters’ penchant for big strike-out performances, fanning 11 men and allowing just two hits and a walk over 7 1/3 innings of work. Atlanta moved quickly against Sanchez in the eighth as Alex Gonzalez stroked a single to give the Braves just their second hit of the night. Conrad’s nightmare continued, this time with the bat, as he popped up a bunt attempt for the first out of the inning. From there, the managerial wheels began to turn. Braves manager Bobby Cox sent right-handed hitting Troy Glaus to the plate to pinch-hit for the lefty swinging Rick Ankiel. That move prompted Giants skipper Bruce Bochy to lift the lefty Sanchez in favor of righty reliever Sergio Romo (1-0). Cox countered by replacing Glaus with lefty bat Eric Hinske, who made the move look like a stroke of genius when he wrapped a line-drive two-run homer around the right field foul pole to put the Braves ahead by a run. But just when the dramatic pinch-hit homer by Hinske gave the Braves a 2-1 lead, disaster struck an inning later in the form of Conrad’s third error of the night. Hard-throwing rookie Craig Kimbrel started the ninth, but his one-out walk to Travis Ishikawa breathed life into a stunned Giants club. After a strikeout of Andres Torres pressed the Giants down to their final out, Freddy Sanchez rolled Kimbrel’s two-strike slider back up the middle to put the potential go-ahead run aboard as well. With two Giants runners on base, Cox again played the matchup game and brought in southpaw Mike Dunn to face lefty-hitting slugger Aubrey Huff. That move backfired when Huff lined a single to right that plated Ishikawa and tied the game 2-2. Conrad’s third and final gaffe of the evening would follow, and it proved to be the Braves undoing. Buster Posey slapped a sharp grounder that skipped between the second baseman’s legs, allowing Sanchez to come across with the eventual winning run. Atlanta proved to be one of the most resilient teams in all of baseball throughout the season, and they will need to continue those kinds of exploits if they hope to continue playing beyond Monday. That said, the Giants gave the Braves a taste of their own medicine with the late-inning come-from-behind victory. Atlanta had 25 victories in their last at-bat during the regular season, and one already in the NLDS, but the Hinske homer would not stand up in the face of a ninth inning collapse. Brooks Conrad’s night became the stuff on infamy. In the aftermath, columns that threw Conrad in with the names of “the Ralph Brancas, the Bill Buckners, the Leon Durhams” popped up almost instantaneously. While most of them were able to keep in mind that the Braves roster has been – and continues to be – drastically altered by injuries suffered to key players, it’s still hard to fathom how one player could have a defensive game of such epically poor proportions. It was so much so that “Brooks Conrad” was the number two trending topic on Twitter… in the entire world in the hours following the game. Conrad has served much of his 10-year professional career trying to find his way into the big leagues after showing a decent bat and little else in the minors for three organizations. Some forget, or simply fail to realize that the only reason that he is in the starting lineup for a playoff team is the number of key injuries to the Atlanta infield. His story should have been marked among the highlights of what was an incredible 2010 season for a Braves club that had missed the playoffs every season since 2006. Conrad became the master of clutch hits, and clutch grand slams for that matter. His game-winning hits represent yet another piece of the puzzle that has the Braves battling for postseason glory in the NLDS. Sadly, one cannot overlook the fact that Conrad’s glove has long been a big part of the reason that he has never had the opportunity to hold down and everyday job in the majors. He committed seven errors in 37 games at third base this year, and his throwing issues there in the final week of the season forced Cox to move him back over to second base to keep the best-hitting infield option the Braves had remaining in the line-up. It’s a fact of the game that when you’re playing badly on defense, the ball will find you. I think we’ve all seen that now. There’s no way to bring back Chipper Jones or Martin Prado. Their seasons are over. Troy Glaus lacks mobility and has played two innings at third base in the majors this season. Add to that that Glaus missed most of 2009 due to injury and then moved across the diamond to first base in Atlanta. That may not stop him from finding his way back in the lineup at the hot corner based on his key double play from Game 2. Diory Hernandez, a career .138 major league hitter in parts of two seasons, is primarily a shortstop. He has only played eight games at second base over the past two seasons (majors and minors), but perhaps he should have checked in defensively given the struggles Conrad has suffered with the glove. There’s no going back now. There simply weren’t better options to be had at the time, but Conrad’s defensive lapses may force Cox to explore one of those options tonight. My guess would be Glaus over Hernandez, as the offense can’t afford to lose the power threat. While much of the blame will sit squarely on the shoulders of Conrad’s defensive shortcomings, the loss of closer Billy Wagner was evident in the ninth inning struggles. fore being lifted with two outs in the frame. A questionable pitch selection by Kimbrel in giving Sanchez a slider after repeated late swings on high-octane fastballs may have been the final straw in the rookie’s outing. There’s no questioning Kimbrel’s stuff, but after issuing a walk and yielding a base hit on a secondary pitch that puts both the potential tying and wining runs aboard, it’s hard to blame Cox for making a move. Some would decry the decision to use the situational lefty Dunn, citing that Huff hits LHP’s better than RHP’s, but that is a fallacy. Sure, Huff had a hit against Jonny Venters prior, but over the course of his career, Huff has been more productive against RHP. Huff had strong stats against lefties in 2010, but his slash lines were roughly the same. Again, choice is often dictated by track record and calculated risk. Postseason games are not a good place for a young closer’s growing pains. If Cox leaves Kimbrel in the game with Dunn warm in the pen and Huff does his damage against Kimbrel, then critics will ask how could Cox not go to the lefty and play the matchup. It’s a classic damned if you do, damned if you don’t situation. As it happens, you have to make a choice. All numbers aside, there’s a 50/50 chance that the batter is either going to make an out or get on base. That is the only percentage that matters. Beyond that, it’s hunches and educated guesses. I’ve said it before, and I’ll say it again: Second-guessing is easy. It’s the first-guessing that’s hard. Regardless of having the luxury of hindsight being what it is, there is no guarantee that Kimbrel retires Huff. One can’t simply assume, because there’s absolutely no way of knowing. Given the eventual outcome of the game, of course the masses are going to side with any other option that was available at that time over the stark reality of a frustrating loss. That’s baseball. That’s sports. That’s life. The Atlanta Braves have been a team that has taken to coming from behind to win games through 2010. Why should the postseason be any different? Rick Ankiel belted a towering solo-shot into McCovey Cove in the 11th inning gave the Braves their first lead of the series and propelled Atlanta to a 5-4 win over the San Francisco Giants in Game 2 of the National League Division Series on Friday. Staring at an early 4-0 hole and with just four innings turned in by Tommy Hanson, the Braves offense was still struggling to find themselves against another strong Giants righty starter. Matt Cain worked 6 1/3 innings and allowed just one unearned run, but this game would be decided in an extra-inning battle of the bullpens. The Giants jumped on top thanks to Pat Burrell‘s three-run homer in the first inning and added another run in the second when Cain helped his own cause with an RBI-single that built the 4-0 San Francisco advantage. When Hanson departed after just four innings of work, Atlanta turned to the one of the team’s biggest strengths, a multi-talented bullpen. Six Braves relievers combined to turn in the seven scoreless innings that closed out the game. A trio of righties and a trio of lefties took to the mound, holding the Giants to just four hits and a walk from the fifth inning on. As the game rolled on, the bats slowly began to come around for the Braves. Brian McCann stroked an RBI-single in the sixth inning to give his club its first run of the series and cut the deficit to three runs. Atlanta mounted a late inning comeback that was vintage for the 2010 regular season. Still trailing by three-runs in the eighth and with all-star closer Brian Wilson on the in relief, Melky Cabrera reached on a throwing error that allowed a run to score. Alex Gonzalez capped the three-run rally with a game-tying two-run double that knotted things up, 4-4. Extra-innings would eventually follow, and it was there that the Braves suffered would could be a substantial blow to the strong relief corps. Closer Billy Wagner was forced to depart the game with just one out in the 10th inning with what was later diagnosed as strained left oblique, which puts his availability for the remainder of the postseason in serious jeopardy. With Wagner out, Atlanta turned to the once-maligned Kyle Farnsworth to extinguish the fire that was started when Edgar Renteria opened the inning with a bunt single and advanced to second on a sacrifice. Farnsworth hit Freddy Sanchez with a pitch and then walked Aubrey Huff to load the bases with one out for rookie sensation Buster Posey. What followed was the stuff of legend. Troy Glaus, who had seen limited playing time over the season’s final six weeks was in at third base – a position he played in the majors on just one prior occasion during the regular season. Posey battled Farnsworth before eventually sending a sharply hit grounder to third base that was fielded by Glaus and fired to second to start an inning-ending 5-4-3 double play. Atlanta turned in a big league best 46 come-from-behind wins in the regular season, but it was Ankiel who would provide the first of the playoffs. His splash down homer off Giants reliever Ramón Ramírez (0-1) broked the 4-4 tie and put the Braves ahead to stay, 5-4. Farnsworth (1-0) finished off the Giants by pitching a scoreless 10th inning and earning the victory that ties the NLDS at a game apiece as the series shifts to Turner Field for the next two games. GAME NOTES… Braves manager Bobby Cox was ejected for the third time his postseason career (158th overall time) after arguing a play at first base with umpire Paul Emmel, the same man who missed a crucial call on a stolen base at second in Game 1 that led to the only run of the night… Alex Gonzalez was just 2-for-35 to close out the regular season and hitless in three at-bats against Tim Lincecum a night ago before lacing the game-tying double in the eighth inning… Rick Ankiel’s extra-inning blast was his first career postseason homer… The Braves acquired both Ankiel, who drove in the winning run, and Kyle Farnsworth, who notched the victory, from Kansas City in the same trade on July 31… Giants closer Brian Wilson entered the game with no outs in the eighth inning, but had never previously recorded a six-out save in his career… Billy Wagner will be forced to sit out the NLCS, should the Braves advance, if he is replaced on the NLDS roster due to injury… Troy Glaus had played just two innings at third base with Atlanta this season after making 1,336 appearances there over his 12-year career entering the season… Atlanta committed the third most errors by any team in the NL (126) during the regular season, played errorless ball on Friday while the Giants, who committed the third fewest amount of errors (73), were charged with two errors on the night, including one by Pablo Sandoval during the Braves three-run eighth inning rally… Tim Hudson will face Jonathan Sanchez of the Giants in Game 3 on Sunday. Melky in the middle for Game 2? Now, I know that the very fact the Atlanta Braves are batting Melky Cabrera in the fifth spot in the order is far from ideal and somewhat confusing to some, but I’m going to try and construct a theory as to why he may – surprisingly – be a classic case of making the best of what’s around. Injuries have claimed the Braves starting third baseman twice this season. The absence of Chipper Jones and his hot corner fill-in Martin Prado have been felt in the field and in the lineup. Both men were manning the #3 spot in the order at the time of their respective injuries. When a team loses their number three hitter, not once but twice, and still makes it into the postseason, then they have already had to “make the best of what’s around” in every meaning of the phrase. The Braves have the best manager in baseball at maximizing the impact of all 25 men on the roster. Often second guessed but seldom, if ever out-managed, Bobby Cox no doubt spent a fair amount of time pouring over his decision before eventually settling on Cabrera and not Matt Diaz, Nate McLouth or Eric Hinske in the Atlanta outfield for Game 2 of the NLDS. One of the things that his players will always say is that Bobby has a way of making each man feel like he can be the difference maker on any given night. That could play a role here as well. tell you that the men batting behind him or those on the bench don’t really offer much in the form of alternatives. Melky Cabrera: Batted 266-3-33 with a .365/.317 (SLG/OBP) vs. RHP this season (RHP Matt Cain starts Game 2). With runners on base, his average was a healthy .274 with 38 RBI in 215 AB’s. Brooks Conrad – For all his heroics, and they were many, Conrad only had 156 regular season at-bats, but you could certainly bat him ahead of Cabrera if you like. His situational stats with runners on base are strong (.274-5-30 in 69 AB’s), and include an excellent .378 AVG with 26 RBI’s in 45 AB’s with RISP. Alex Gonzalez – Finished the season 2-for-his-last-35 and promptly went 0-for-3 vs. Lincecum in Game 1. He’s been ice cold, and that’s not exactly the kind of thing you can afford to just trot out there in fifth spot and hope it improves. Rick Ankiel – Batted just .210-2-9 in and struck out 42 times in 119 AB’s with Atlanta. He has provided some pop in the past, but his stint with the Braves (47 games) has not been very productive. Nate McLouth – He will be watching from the bench, but McLouth hit just .190-6-24 in a disastrous season and has seen his range in center field diminish. All six homers were hit against righties, but his .205/.368/.317 (AVG/SLG/OBP) vs. RHP this season does not scream middle of the order bat either. A cursory look at the numbers Cabrera posted this season would tell you that he has not been especially impactful to this point, and has looked like little more than a fourth outfielder who was pressed into regular play with the rash of injuries and ineffectiveness that ravaged the Braves outfield. One thing that Cabrera has that others (save Hinske) do not possess is that all-too-valuable postseason experience, so maybe that played some role in Bobby’s final decision. Like I said before this whole entry really got going, having to bat Cabrera fifth in a playoff game was never part of the Braves master plan, but they’re way beyond that now. The Braves need a productive showing collectively from the offense in order to even the NLDS at a game apiece and make a run deep into October. Greetings out there in Braves Nation. It has been quite some time since last I wrote. By the looks of it, somebody was paying attention when I mused giving the sometimes maligned and occasionally productive Willy Taveras a job in the organization. I knew if I left that entry up long enough, it would elicit a response. Perhaps, we’d be better suited taking a look at the recent Trade Deadline movement. The Braves have roared back to the top of the National League East this year. There was that little speed bump early, but now the team is primed to make a run in October for the first time since 2005. While much has changed since that last playoff appearance, some things are eerily the same. Remember when Atlanta was making deadline deals that season? I do. It’s funny how the Braves were busy trying to bolster their bullpen some five years later and were thinking along those same lines. Kyle Farnsworth has been productive for the Royals this season. His power arm won’t be expected to close games this time around, but should fit in nicely with the current mix to bridge the gap to Billy Wagner. Atlanta also added outfielder Rick Ankiel in that trade with Kansas City. The jury is still out on what exactly Ankiel can bring over the course of a full season, but the Braves will seek to get every thing they can out of him in 2010. I wouldn’t go as far as to say that the price was particularly steep, but what I did find somewhat curious in the deal was the inclusion of left-handed reliever Tim Collins. Atlanta acquired Collins from the Toronto Blue Jays as part of the Yunel Escobar trade, but his stay in the organization proved to be brief. Collins, just 5-foot-7, has very impressive strikeout numbers that come thanks to a wicked curveball. While he was named the Blue Jays Organizational Pitcher of the Year by MLB.com following last season, there are some who believe his eventual role in the majors would likely be that of lefty specialist. After watching him pitch in the Florida State League last year, I have to say that there is just something special about the little lefty. His path to the Big Leagues should only improve with a move to the Royals organization. Seeing as Wagner was slight of stature and big on stuff, Collins could be a success story in the same vein down the road. Parting ways with both Gregor Blanco and Jesse Chavez shouldn’t impact the Braves whatsoever. If anything, adding a pair of more experienced players simply gives Bobby Cox more pieces to work with in his final campaign at the helm for the Braves. Depth is key. QUICK HITS: Second baseman Martin Prado will try to avoid the disabled list after suffering a fractured pinky while sliding into home during the 10th inning of Friday’s victory over the Reds. Atlanta can ill afford to lose the NL hits leader (138) and the team leader in runs scored (75). A decision will likely be made on Monday as to whether or not he will land on the 15-day DL… Hand injuries have been a common theme this season, but rookie standout Jason Heyward has bounced back nicely from the ailing left thumb that slowed him down prior to the All-Star Break. The right fielder is hitting .349/.453/.460 in 16 games since the break. He even threw in a steal of home last week against Washington to remind everyone just how impressive the soon-to-be 21-year-old truly is. Why not take a flyer on Willy Taveras? While bigger names remain on the free agent market, a recent development may have given the Atlanta Braves something to consider for their outfield mix as Spring Training approaches. Signing Willy Taveras could supply the Braves with some valuable speed for an extremely low price. Taveras had a rather bizarre February 1, being dealt by the Cincinnati Reds to the Oakland Athletics only to find himself designated for assignment later that day. Unwilling to accept an assignment to the minor leagues, it left the A’s with no choice but to release him on Tuesday. Oakland will pay the bulk of the $4 million Taveras is owed this season. Any team that signs Taveras, 28, would have to pay only the league minimum to secure his services. Despite leading the National League with 68 stolen bases as a member of the Colorado Rockies in 2008, Taveras was non-tendered that winter in a cost-cutting move. He would not stay unemployed for long as the Reds signed Taveras to a two-year $6.5 million deal last winter. A lackluster 2009 campaign, including a career-low .240 batting average to go along with an ugly .275 on base percentage, forced the Reds to take another look at their outfield options and ultimately ship Taveras to Oakland. His once promising career could officially be termed as derailed, but a better phrasing may be to call it at a crossroads. Taveras has been on two World Series series teams. First, finishing second in the N.L. Rookie of the Year voting in 2005 as a member of the pennant winning Houston Astros, before hitting a career-high .320 as a member of the N.L. champion Colorado Rockies in 2007. I’ll be the first to say that signing Taveras would come with its fair share of if’s, but adding a relatively young and low-priced player with postseason experience is an option worth exploring. It would also give the club another reason not to rush heralded prospect Jason Heyward this Spring if more minor league seasoning would be in his and the club’s best interest. If Taveras were to rebound to his 2007 standards, he would provide a short-term solution who brings a completely different look to the cast of Braves outfielders. Taveras would obviously pose no threat to the impending arrival of Heyward, instead serving along with Melky Cabrera and Matt Diaz to flank center fielder Nate McLouth until which time Heyward gets the call. Though primarily a center fielder himself, Taveras would see more time in left while being available to spell McLouth if needed. No one is accusing Taveras of being an impact player, but if he can reach some of his past productivity it would give the Braves a chance to mix and match their lineup in a number of favorable ways. And that would make an impact. Possible line-up options could include allowing McLouth to move down a spot in the order to take advantage of his run-producing power. Yunel Escobar saw time in both the 5th and 6th spots in the lineup last season and could benefit from a permanent move to the middle of the batting order. Among the offensive weaknesses of Taveras, and there are a few, is the unusual trait of being a right-handed hitter who performs better against right-handed pitching. His career marks see him at .262 against lefties and .280 against righties, while his ’09 stats had him at just .219 against southpaws and .247 against right-handers. The presence of Diaz (.347 career and .412 last season against lefties) would allow the Braves to avoid that unfavorable match-up. Taveras offers very little in the form of extra-base hits. His slugging percentage dropped to a career-worst .285 last season as 83 of his 97 hits were singles. This is nothing new for Taveras, who lead the NL with 152 singles among his 172 hits during his rookie season of 2005. A portion of this can be overlooked because Taveras is a base stealing threat (194 in 236 career attempts). As a rule, Taveras typically hits his way aboard. Walks have always been at a premium and that contributes to his .321 lifetime on base percentage. He drew just 18 free passes in 102 games last season and owns just 134 in his five full seasons of Major League action. His fielding has also been suspect at times. In 2008, Taveras compiled a .976 fielding percentage – the worst among all center fielders in baseball. But, again, he would likely not see much time in center field with McLouth there. Most, if not all, of the attention the Braves are getting in the rumor mill is revolving around the somewhat quizzical unemployment of Johnny Damon. We have been repeatedly reminded that the only way that Damon is going to be suiting up with a tomahawk across his chest in 2010 will be a thanks to a serious drop in asking price. With agent Scott Boras trying to recoup the cash that was lost when he and Damon rebuffed the Yankees’ offer(s), there is likely to be another destination (I’d say in the American League) that will bend their financial plans just enough to accommodate the outfielder for at least one season. However, there is little doubt that Damon will be taking a hefty pay cut no matter where he lands. Pay cut and Scott Boras are seldom used in the same sentence. Here’s to firsts! 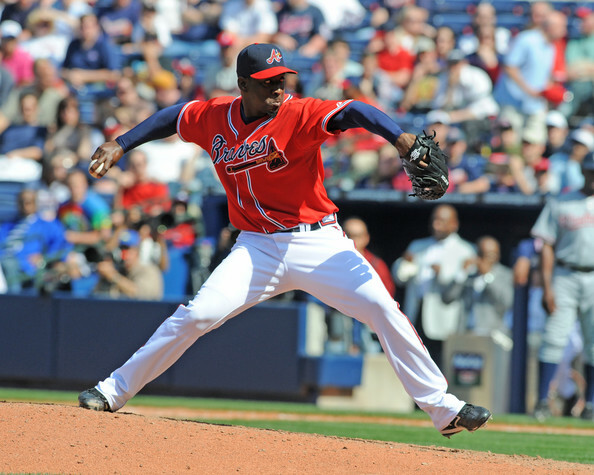 Atlanta Braves general manager Frank Wren has wasted little time building a formidable bullpen for 2010. Just one day after signing closer Billy Wagner to a one-year deal, the Braves reached terms for a one-year pact with righty reliever Takashi Saito on Thursday. The deal carries a guaranteed $3.2 million base salary, while Saito could earn and additional $2.3 million in performance based incentives. The Braves introduced Saito to the media on Thursday afternoon at a press conference at Turner Field. “I think we’re very fortunate to get two outstanding relief pitchers in two days, and we haven’t even been to the winter meetings yet,” said Braves manager Bobby Cox. Pitching for Boston last season, Saito went 3-3 with a pair of saves in 56 outings, striking out 52 and turning in a 2.43 ERA in 55 2/3 innings of work. Opponents hit just .244 against him. Saito, 39, enjoyed success in the National League with the Los Angeles Dodgers over the first three years of his Major League career beginning in 2006. He was named to the NL All-Star team in 2007, when he went 2-1 with a 1.40 ERA and 39 saves for the Dodgers. Over his four-year career, Saito is 15-10 with 83 saves and a a 2.05 ERA in 236 career appearances. The hard-thrower has struck out 297 men over 245 1/3 innings and limited his opponents to a .196 batting average against. A sprained elbow ligament forced Saito to spend two months on the disabled list in 2008, paving the way for Jonathan Broxton to assume closer’s duties for the Dodgers. The Braves will use Saito to spell Wagner on some nights, giving the club the kind of options that Mike Gonzalez and Rafael Soriano offered last year. Saito and Wagner will join holdovers Peter Moylan, Eric O’Flaherty and Kris Medlen in the Atlanta bullpen next season. While more relievers will be in camp, it would appear that the major moves in the pen have been made.